How long have we held to the tradition of planes flying over Sun Pictures and having a laugh at tourists ducking for cover as planes flew overhead? With the addition of an onshore helicopter base servicing the mining sector, air traffic noise has risen immensely over the years. Today in 2013, it is hard to make yourself heard while dining alfreso in Chinatown. Once a popular destination, for Film Makers and the like .. film producers are less interested in using Broome as a location due to the downtime in recording whilst waiting for aircraft to pass. 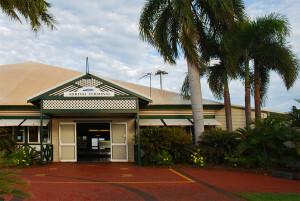 In April 1991, Airport Engineering Services (AES) were granted freehold title of the Broome Airport from the Australian Commonwealth Government and the Shire of Broome by a Heads of Agreement. The AES were given Roebuck Estate and the Boulevard Shopping Centre to develop and the profits were to be used for relocation. The State also granted AES freehold title to land identified for relocation, 13.5 kms from Broome. Again in 2005, the Broome Planning Steering Committee Report established a position that the airport should be relocated to the site out of town. 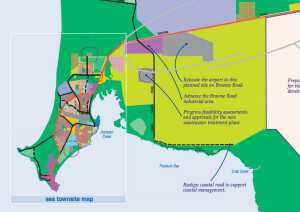 At the 2040 Visions of Broome Workshop, a Broome Shire initiative, it was suggested that the airport be moved to make way for the expansion of the town centre, Chinatown. Airport owners now say it is too expensive to relocate. ????? 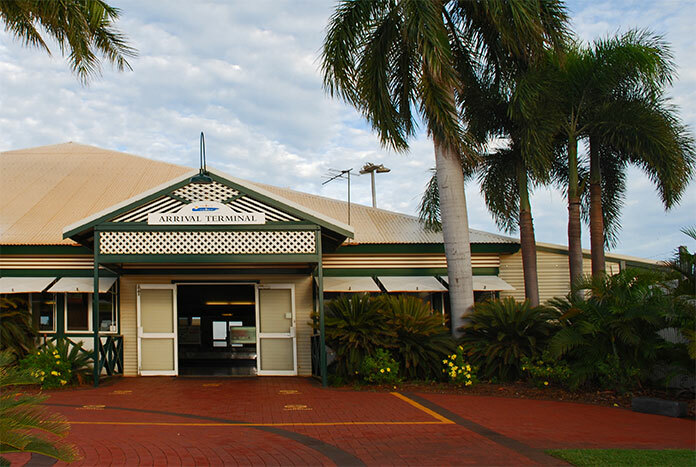 Do you think Broome Airport should be relocated? I think the Broome airport should stay right where it is. And yes I am on record on the radio saying that they moved the airport 2 km and then put a “whopping great hill in the middle of it and left a hill (originally intended for a tower, which i don’t think ever happened) beside it, to the point where it was dangerous to aircraft when another aircraft was using cross strip ( no vision and a radio bank out zone AND the school complaining of noise pollution ( which they did not win). I do realise that Broome and every scenario is different…..but don’t see the need to move this one…..I think far more people like the planes ( noisy or not) and the convenience. Hi Jane, thanks so much for your opinion. 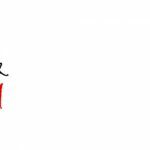 I think Chinatown should be kept as a cultural heritage site and with the removal of the airport, which divides the town in half, open space cultural parks and gardens and residential areas could be planned with Broome Community input. My first trip to Broome in 1964 and every trip since in an aeroplane has involved landing at the current airport. Broome has grown a lot since then but we still have plenty of room. To move the airport would add an extra $110.00 to each and every ticket in and out of Broome. As we do not need the land, the push to move it is as ill- informed as it is expensive. I personally would be very disappointed to see the airport move. My husband is a pilot and we love watching him flying off into the sunset!! I love the convenience of the airports location. Moving the airport 13kms out of town adds at least 20 mins to your journey to the airport and we all know that if by chance you miss your flight there isnt exactly a hundred other options as there are in major cities. The airport is perfectly located and I for one don’t believe the film makers who don’t come to film here do so because of the location of the airport but more likely the ridiculous cost of living here. Sure the airport gets noisy but what is to say that in ten years all the area around the new proposed site wont be congested with houses too??? If you choose to buy in Roebuck estate you accept that the airport is close by and may be noisy at times. It is a choice. Moving the airport is not going to provide this town with anything more than headaches and angry passengers. As it is getting a taxi to the airport is a nightmare. How much longer would our tourists have to wait if the airport is that much further away??? What a great start to an expensive holiday the tourists would have. Seems the key objections are noise, inconvenience to possible film makers and Chinatown needs to grow. I have lived close to the airport for over 20 years and noise is not a problem. Momentary interruptions from takeoff or landing noise for latte sippers like myself in Chinatown is a small price to pay for the sense of vibrancy the airport brings to sleepy old Broome, not to mention the convenience for the community and the visitors we rely upon for so much of Broome’s prosperity. Perhaps having an airport in the middle of BROOME is part of our unique selling proposition for tourists and without it Broome sense of place and uniqueness (?) may be lost. I’m not sure that’s we should be hanging our hat on Broome becoming the Hollywood of Australia. The odd film shot in Broome every couple of years is a nice little earner but hardly a rational reason to move the airport. Australian movies rarely make money. Low budget films typical of the ones likely to be attracted to Broome are less likely to make money and wholly unlikely to add to Broome’s economic base other that a bit of free marketing. Chinatown needs to remain the commercial centre of Broome and to do this it will need to expand to accommodate more retail and commercial space without overwhelming the precinct. There is currently ample room for growth through the development of vacant land and redevelopment within the precinct and areas east and south of the airport land. 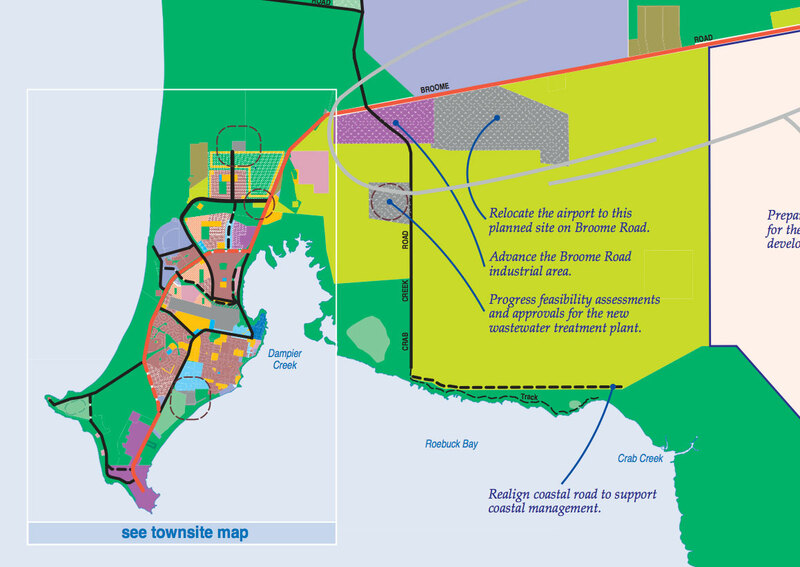 Provided Broome continues to elect for growth and prosperity and eventually becomes the Darwin of NW Australia then one day the airport may have to move but this is unlikely to be within the next 20 years. Consider also that the cost of constructing a new airport and facilities is likely to be north of $200 million. You don’t need to be a Rhodes scholar to understand that that the cost structure and therefore landing charges, ground handing fees and debt servicing of a $200 million development is going to be a whole lot more than the cost base of the current airport. So how is that going to help driving flight costs lower or the introduction of low cost airlines which everyone agrees will help grow tourism. be careful what you wish for! 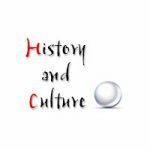 I do congratulate the establishment of this blog as it great to get the community involved. I also await the results of your online survey. The result will be an indication of the communities desire. I trust you will also respect divergent opinions and will be very mindful of the results. How long will you run the survey for? Thanks so much for your comment. With regards to the poll, it will never expire, and there is a link on the poll that anyone can click that gives the results. The poll and therefore the results are run by an independant company. Even if I was so inclined, which I am definitely not, I could not manipulate the results. When setting up the poll I checked the box that should stop people from being able to vote more than once, let me know if that is not the case. I think it is a fantastic opportunity to get everyone’s opinion as these things should be decided by the community! I would be happy to see the airport re locate once there was a suitable alternative, I don’t feel housing cuts it. Bearing in mind the creek almost laps up to the runway on king tides wouldn’t it be amazing to extend the creek in to a canal development including a marina. It could utilise town housing to pay for the development along with pen fees rent etc. Board walks down both sides littered with restaurants Cafes and tackle shops. You could have a coffee or a beer and watch the kids fish! If people could bring their yachts and larger boats into Broome and have them safely mored watch the money start rolling back into town officially putting Broome back on the boaties map. This could be a long term answer to a safe boat launching facility, recreation area, marina and tourist hotspot, wouldn’t it look amazing from the air as the tourists fly in to town. Dream over, until then the airport is great where it is, I still occasionally pull over to watch a jet take off or land. keep it where it is ,its unique and although a little noisy for housing in reobuck estate,the airport was there when well before housing began. Peter’s comments are great. But his costs are way out. The current resurfacing will cost many millions of dollars! My guess is that design and approval times would be 4-5 years ( and that includes time for setting up flight paths, instrument approach and departure procedures) and then construction and commissioning- say 3-4 years. Think about 8-10 years from the time land is made available. Let’s look at the economics and the cost to each traveller.If we assume a conservative $800m in development costs, the interest costs alone on the debt to finance the new airport based on say project finance at 7.5% would be $60,000,000 per year . That might reduce over time if sale of the old airport land is used to retire debt but expect no reduction for the first 7- 10 years of the project financing. If we assume some 5 flights a day, 7days a week for 365 days a year with 100 passengers a flight the charges to cover interest costs alone amount to $328 per passenger. Now what about the return on investment to the airport owners for their investment? At 2.5 % that is another $20,000,000. And don’t forget the higher operating costs ( I assume that everyone would want an fully air-conditioned terminal? ).Over a 50 year life using discounted cash flow techniques the additional cost of a ticket might still be more than $150 per passenger. For tourists then, as Peter says, there is the additional cost of transfers to and from a new airport and the additional travel time. For a regional town of 15-16,000 people we are very lucky to have an airport that is one of the busiest in the country and provides such a great service to both locals and tourists and has been able to attract the four airlines that we have providing many flights a day at convenient times. To suggest that any airport owner whether they be government or private sector is going to commit to such an investment because people think that it should be moved because of some minor inconveniences is just fanciful. Governments have by and large sold all their airports in Australia as the private sector has demonstrated a lower cost of operations. Government won’t come back into this sector. Let’s be very positive and accept that what we have with Broome Airport is pretty good and the minor disadvantages are not even worth while arguing about when we consider the higher cost alternative- and what Broome would need to do to make such an investment worthwhile. The Airport should stay where it is. It is actually a Tourist Attrraction and Not a negative , flying to the Virtual Centre of Broome is an anomaly in Australia and that is the reason it should stay where it is. 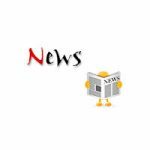 The airport SHOULD NOT BE RELOCATED because of all the previous reasons – also the only night flights are emergency RFDS fights and who would be against a mercy flight because of noise! Taxi fares from relocated airport would also be more expensive and all the tourists LOVE the fact that the airport is “in the middle of the town” and often comment on it – Lets keep the tourists happy – God knows Broome does not have a lot more to keep it viable at the moment !!! There will an abundant amount of opportunities for filmmakers and producers regardless of airport noise… For example a documentary could be made about the destruction of Broome’s commerce, which would feature the minority of the populations tree huggers and labour orientated persons with absolutely no vision or understanding on how economies work and are sustained. Whilst surveys such as this are not necessarily representative of the broad communities view it is interesting to see such an initial response overwhelmingly in favour of the airport remaining in it’s current location. 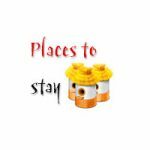 Perhaps more instructive are the comments explaining many of the positive benefits of the airports current location and the negative effects of a move. As in all matters cool, calm reflection and analysis of an issue are critical. Knee jerk reactionary solutions to problems usually have unintended consequences. The lesson from this for me is the vocal few rarely reflect the wisdom of the silent many. Democracy and the community are best served when the silent majority no longer remains silent. This airports location is unique to Broome and has become quite a tourist icon. The location allows ease of access to all town areas within the vicinity and the distractions/inconveniences are few. Those that seek to relocate the airport at enormous cost need to have another look at their agenda and what will be best for Broomes future. At this stage, it is not a relocation that best serves us, the people of Broome. And agree Peter Taylor, the silent majority need to ge involved! A pair of newly published studies in the British Medical Journal suggest exposure to aircraft noise may have direct effects on the health of people who live near airports. One study found an increased risk of stroke, coronary heart disease and cardiovascular disease for hospital admissions and deaths in relation to daytime and nighttime exposure to aircraft noise for residents near Heathrow airport in London. A separate study found that airport noise was significantly associated with a higher relative risk of hospital admission for cardiovascular disease in older Medicare recipients who live near 89 U.S. airports. Noise pollution adversely affects the lives of millions of people and studies have shown direct links between noise and health, according to the U.S. Environmental Protection Agency. Hearing loss is the most common and often discussed health effect, but research has shown that exposure to constant or high levels of noise can cause countless adverse health affects. Problems related to noise include stress related illnesses, high blood pressure, speech interference, hearing loss, sleep disruption and lost productivity. Because of its geographical location, Broome’s vulnerability to climate change cannot be underplayed. We stand to experience significant losses. We will face – indeed we are seeing the impact of some these issues right now- prolonged droughts, flooding and increased frequency of extreme weather events. Our rich biodiversity is at risk as well. Those who seek to silence debate on this issue or pretend its not happening to us only delay in real engagement to find real solutions and are marginalised to the edges of what the science is telling us. Decades of research, analysis and emerging environmental evidence tell us that far from being merely just an environmental issue, climate change will touch every aspect of our life as a nation and as individuals. Regrettably, we cannot prevent or escape some negative impacts of climate change. We and in particular the Broome community have to prepare therefore to adapt to the changes we will face and also ready ourselves and our toen planning to mitigate against these changes. Moving the airport should be about this adaptation. Understanding the science and planning appropriately because we all have a duty of care for future generations. This is not about a them against us debate because I believe everyone who has made a comment on this blog really do believe they have Broome’s best interest at heart and have good ideas. This is were we should start to come together because this is OUR shared concern. Put aside our differences, focus on our common goal which is what is best for Broome in the changing climate era. In all reality if we put our heads together I really do believe we can come up with a plan, thats good for the economy, the community and our environment. Yes, moving the airport will be very expensive but not planning for sea raising levels and protecting what little infrastructure we have is going to cost a hell of alot more. But doing this and doing it well we will ensure that we are a unique and inspirational community. A quick look at the voting puts this in perspective, nearly 83% say leave it where it is. The rationale for moving it makes no economic or social sense, it is also one of Broome’s biggest tourist attractions. There is no other town in Australia of it’s size that has the network of flights that Broome has. As Tony points out the cost to consumer to fund a new facility would be substantial and then the extra cost of transport to and from the airport would push the cost of the total trip to a much higher level than it is now. Guess what this will discourage tourists, the airlines will then reduce services. This will further increase the cost of seat and make the cost of departing Broome beyond the means of the average resident. Move it out of town it’s way too noisey!!!! Noise is stress!! Think off all the pollution we are breathing in every day. More helicopters start at 5;45 every morning, it’s impossible to sleep past then. Everyone on our block can’t sit out side and have a conversation in the morning or evening as it’s too noisey. Our lights rattle in our house and our neighbours door rattles. We all have to go indoors and close up the house and we can still hear it. The noise and fumes are oppressive and somthing needs to be done about it! PEOPLE POWER! Many things are being changed by people power. There is a telephone number on this post for you to ring. Airservices Australia Noise Complaints and Information Service Hotline: 1800 802 584. The more people that ring the number, the greater the chance of something being done.